Mark Levin’s new book, The Liberty Amendments, is getting a lot of press since its release earlier this week. It rose to #1 on the Amazon best seller list on its first day. According to Levin, the book is how to restore the Constitution using means already available within the Constitution. Brent Bozell and Cal Thomas have written articles on the book as shown below. When I studied the U.S. Constitution in school, I learned that for a bill to become law, it first had to be introduced in either the House or the Senate. Today, a cynic might say for a bill to become law, a member of Congress must first be introduced to a lobbyist. Much of government’s dysfunction, cost and overreach can be traced to the abandonment of the constitutional boundaries the Founders put in place for the purpose of controlling the lust for power. In his new book, “The Liberty Amendments: Restoring the American Republic,” Mark R. Levin asserts the U.S. government isn’t performing up to standards established by the Founders because, like a flooding river, politicians have breached their constitutional limits. And yet they make decisions in the name of the Constitution that cannot be defended according to the words of the Founders, who believed the judiciary should be the least powerful and consequential branch of government. To return America to its constitutional boundaries, Levin proposes a series of “liberty amendments” to the Constitution, beginning with one limiting the terms of congressmen so they might avoid the bipartisan virus that infects even some who believe in limited government, mutating them into power-hungry influence seekers with little regard for the public good. Another amendment would establish spending limits for the government. Another would grant states the authority to check Congress. Levin admits these amendments are unlikely to win congressional approval because in Washington power is not willingly relinquished. That’s why he proposes the states bypass Congress, as the Framers provided, and pass these amendments themselves. Americans who care about the health and future of their country have the power through the states to force the federal government to abide by its founding document. Mark Levin’s book is a serious work that can serve as an action plan for curing what ails us. One of the core concepts of Levin’s proposals is the restoration of federalism between the states and Washington instead of the centralist government we now have. Levin calls this ‘statism.’ Whether we call it a centralist government or statism, the result is the same—more power in Washington and less to the states and individuals. The other review appeared on Investor’s Business Daily by Brent Bozell. Only those happily trampling on the last vestiges of freedom will deny that our federal government as a constitutional republic has ceased to function. The president can no longer control (nor does this one want to control) the enormous and ever-expanding bureaucracy functioning as a government by fiat. The legislative branch, so corrupted, so drunk by the allure of power, so disdainful of its constituents, is unable to stop its bankrupting ways. The judiciary is perhaps worst. The Supreme Court is openly rejecting the authority of the Constitution itself. If the federal government refuses to adhere to the enumerated powers of the Constitution, what can the citizenry do about it? The events of the past five years (more, actually) prove this. It has become virtually impossible to stop the agenda of a radical chief executive who brazenly uses the federal government as his personal political machine. It is almost impossible to defeat an incumbent in Congress with all the advantages it has awarded itself. For all intents it’s impossible to replace a member of the Supreme Court. The left is content with this terrible turn of events. By “transformation” they meant the transfer of power to the state. Conservatives are loath to declare American exceptionalism dead, yet are powerless to stop the statist steamroller. With every cycle, the situation worsens. At some point the unthinkable — tyranny — is upon us. We are running out of time. Only radical surgery will save the patient now. Enter Dr. Mark Levin with his new book, “The Liberty Amendments: Restoring the American Republic.” Levin is a Constitutional scholar — and he shines. He argues passionately that the federal government can be brought under control only if new limitations are thrust upon it by its citizenry. He proposes a Constitutional convention, not one called by Congress but by two-thirds of state legislatures. It would require a three-fourths margin to pass any amendment. It is the lesser known of the two options provided by Article V of the Constitution. What should a Constitutional convention tackle? 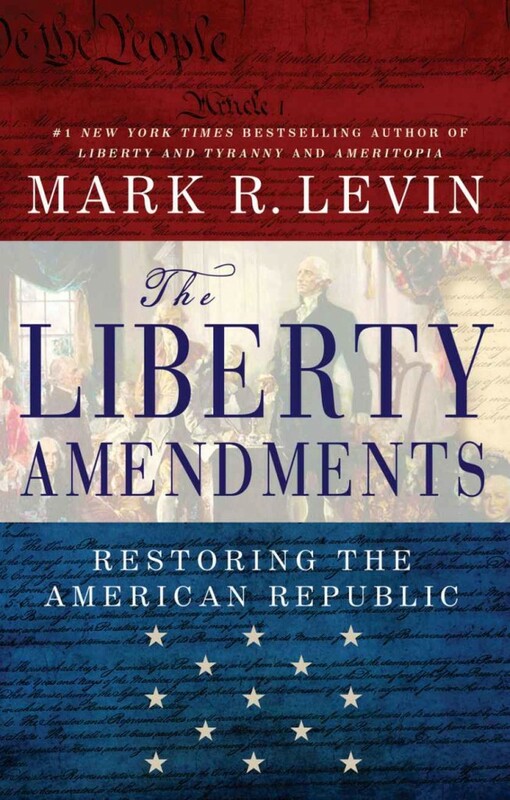 Levin offers 11 amendments for consideration, with appropriate subdivisions, each carefully researched and designed to reduce the power of the state. Term limits for Congress is the first liberty amendment Levin offers; it is my view also the most important. Only when there are limits (12 years) will Congress be populated by men and women driven only by the call to service, not the siren song of power. The millions delivered by special interests for the re-election of incumbents who, in turn, reward said interests with billions in grants, contracts, tax shelters and the like — will cease. Levin calls for other limitations on Congress. He proposes an amendment to limit federal spending and another to limit taxation. The combination will restore fiscal sanity while devolving power from the state. He offers an amendment to repeal the 17th Amendment, returning to the Article 1 mandate that senators be chosen by their state legislators. Levin notes: Sometimes mistakes are made (Roberts, anyone?) and America shouldn’t be punished for the rest of that jurist’s life. He proposes 12-year term limits for them, as well. What can be done to control, even reduce the size and scope of the bureaucracy? All federal departments and agencies must be re-authorized by Congress every three years or be terminated — that’s what. There’s a liberty amendment to protect and promote free enterprise, now under assault. One to protect private property given the ability of the federal government suddenly to steal it. Amendments to increase the power of the states. Finally, an amendment to protect the voting process. Who would have thought such amendments would be needed? That’s the point. It’s the nature of the crisis. It is time for our legislatures once more to issue the clarion call. Levin hopes “The Liberty Amendments” will launch a national discussion. It will. Levin is a consequential man, and this is a consequential book. Some critics will dismiss the idea. But nothing else is working, and nothing else will do. We have reached the tipping point. Levin, on his radio show (locally KCMO-710 at 5pm weekdays), jumped the gun on the book’s release. He began talking about some of the concepts late last week with some tantalizing hints. If you have ever read Levin’s bio, you’ll quickly see he knows government—from the inside and well as the outside. His Landmark Legal Foundation is currently suing the EPA over violations of law and their own regulations. Levin wants the states to apply pressure to the central government. He outlines means and methods for them to do so. I don’t have a copy yet, but I’m looking forward to reading this latest Levin book.